Mario, of Team Cran, throws a drive wearing a lot of clothing. 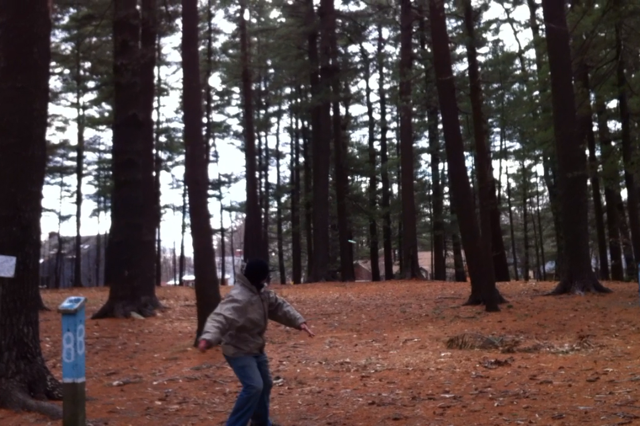 Saturday, February 25th 2012, produced some of the windiest disc golf Amesbury Pines has seen in a very long time. For NASA, winds are expected at their open, hilly, Topsfield home course of Pye Brook. However, both rounds for this match were held at one of their other home courses: Amesbury Pines, and the magnitude of the wind gusts was far beyond any sort of normal “Home-Team Advantage.” There were no holes that played like they normally play, so the only home advantages were course-familiarity and travel (lack there of). NASA produced five more players than Cranbury, but with the commute from Cranbury Park at over three hours to Amesbury Pines it’s bound to turn out this way. Whether or not this gives the edge to the smaller team or larger team is up for debate, since it depends on the quality of the players and the necessity of qualifying team players for the end of the year Team Finals. The story of the day was the wind. It was quickly established during the morning’s match play that the winner of a given hole was the one who could lay-up soonest. Fifteen foot putts were extremely hard to sink, especially with the handful of unique Amesbury baskets (with just single heavy-gauge chain). Many players were seen putting with a Hornet or Drone instead of a putter. When it came time for the doubles matches, the in-round strategy was interesting. Much like most doubles matches, if one player lays up it means the next player can “go for it.” In this weather however, it became a necessity to lay-up even at short distances; and when a player was “going for it,” it meant they were throwing an over-stable disc with the force of a driver, sometimes from just 25-30 feet. Accuracy was impossible without power, and the strong majority of birdies came off a team’s second attempt (after the safe lay-up). The edge in the morning’s match play fell to NASA with a fairly heavy margin. Four of these singles matches were pushes (ties), with each team being awarded a half point. The strategy for each team then made a huge difference with doubles. With NASA needing only three teams to win their rounds to win the match, it was up to the captains (JD and Whit respectively) to pair off their teams and find a way to win. The approach of a team with a lead is more of a “we-must-win-X-number-of-match-ups” as opposed to “we-can’t-lose-any-match-ups.” This offers the leading team the chance to form stronger pairs than normal, with the mentality of “these guys should take it down.” History repeats itself apparently, because the familiar teams of “Chad Hall/Dan Oulette” and “Drew Smith/Matt Thomas” came away with key victories. Chad and Dan had a stellar comeback win against Tully Rock showing great team work, while Drew and Matt had set the doubles course record at Amesbury against Borderland. The third and final doubles victory for NASA came from Daniel Marcus and Marielle Mallar. An interesting and evidently pivotal decision became the singles match up for the second round. With an odd number of players available for Team Cran, each team had to provide a player to play a round worth only a single point. The final score was a NASA victory at 15-11, with Cran winning the singles match. Hindsight is 20/20, and it really is a “6 of 1, half a dozen of another” argument; but essentially the only thing the singles match could do for Team Cran was force a playoff, or lose the match. It couldn’t “win” the match, since the doubles matches are worth 2-points a piece. In other words, at 15-11 (with Cran winning the singles match), they had needed another doubles team to win to force a tie. If the singles had lost in this hypothetical instance; Cran would have lost. If Cran was to win the whole match outright, it would have required TWO more doubles teams to win; in which case the singes match wouldn’t matter and would not have affected the result. The reason this became important was Cranbury played possibly their strongest player (Bobby Cowperthwait) in the singles match. In reality, this was a safer way to play, because if you have confidence in your strongest player to win a head to head match up; you then need fewer teams to win in doubles to force a comeback tie. Yet, at the same time, one might expect the strongest player to single-handedly take down a doubles match- which is worth 2 full points. Team strategy, while interesting conversation fodder, takes a back seat to performance in the end. If a team plays better, and stronger, they win. In this case, Team NASA protected their home turf, played through the 50 mph wind gusts and found a way to win against a strong Cranbury Park team. This entry was posted in News, Stories and Miscellaneous and tagged challenge, crabury, cran, disc, golf, NASA, nefa, park, team, vsvn. Bookmark the permalink.